Image courtesy of Library of Congress An eight-term Member from Indiana, Albert H. Vestal served four terms as the Republican Whip. 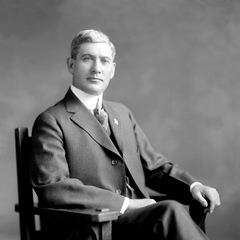 On this date, freshman Representative Fred G. Johnson, a Nebraska Republican, won the title “Champion Horseshoe Pitcher of Congress” by defeating fellow GOP Congressman and Majority Whip Albert H. Vestal of Indiana in the first congressional horseshoe match. The single-elimination tournament, sponsored by the Little Congress Club, was an all-House affair. Several Senators slated to participate failed to show up and were eliminated by default. In the semifinals, Vestal handily defeated Republican Representative Fred D. Letts of Iowa, 22–10; Johnson dispatched Democrat Thomas S. McMillan of South Carolina, a former professional baseball player, 21–10. In the final match, which the Washington Post described as “a one-time rural pastime between two one-time country lads,” Vestal jumped out to a commanding 13–3 lead but Johnson clawed his way back into contention with consecutive, 3-point ringers in the 10th and 11th rounds. After 20 rounds the score was knotted at 20 apiece; then, Johnson scored the game-winning point. The tournament was carried live over the National Broadcasting Company radio network, with Representative Clarence J. McLeod of Michigan and Senator Alben W. Barkley of Kentucky providing play-by-play commentary. For his efforts, Representative Johnson won "a set of silver-plated horseshoes in a leather case." His horseshoe skills, however, failed to impress constituents back home in southwestern Nebraska; in the November 1930 elections, they chose a Democratic challenger to succeed him. The tournament tradition appears to have died out quickly as the economic travails of the Great Depression deepened in subsequent years.